Is Gerry Harvey worried about the rise of Amazon? In our last podcast, Peter Switzer and Paul Rickard got personal with the man himself. New episode out tonight! Send questions to info@switzer.com.au. What are the Coalition's chances of winning the election? With less than five weeks until the election, Malcolm Mackerras shares his early predictions with Peter and Paul, plus David Kirk, former Fairfax chief executive and former All Blacks captain, joins the show. Peter and Paul are joined by Booktopia founder Tony Nash to look at the success of Australia's biggest online book retailer, plus Moneywise's David Giles shares the major takeaways from the Budget and some helpful advice ahead of tax time. 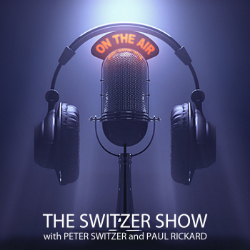 This week on the Switzer Show, the chairman of Fitstop, Stuart Cook, the SVP of Global Communications for Philip Morris International, Marian Salzman, and the founder of payment platform Verrency, David Link. For a special property episode, this week Peter Switzer and Paul Rickard are joined by SQM Research founder Louis Christopher and REA Group chief economist Nerida Conisbee, plus your questions answered.